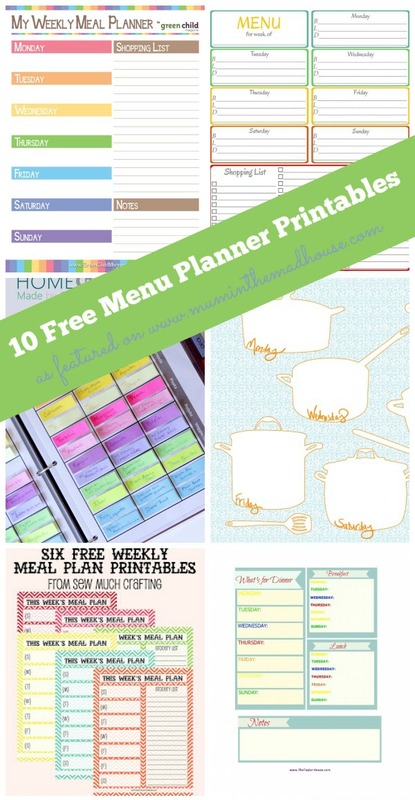 Ten Fabulous Free Meal Planning Printables - The Wigley Family: One from Boston, one from Birmigham and 2 more beside! If you are really organised then Organised Junkie has a monthly and weekly menu plan. Oh and a yellow and grey weekly menu plan too, which was my colour plan last year! While Sew Much Crafting has a six weekly menu planning printable. I love this colourful monthly planner with post it notes, perfect for people that change their minds! Do you menu plan? Did you know that wasting food costs the average household £470 a year, rising to £700 for a family with children, the equivalent of around £60 a month. Menu planning can save you throwing away food, ensuring the food you buy is what you need and cook with. I have my menu plan on our chalkboard wall in the kitchen and Cass from Frugal Family has a beautiful wipe clean planner in her kitchen that she made. What is your families favorite meal? Do you have a post that is about thrifty parenting, decorating or lifestyle. One that is about frugal food or crafts and art. or even a post about making the post of what you have, then please do link up. Each week we make sure we pin the post, feature some on our facebook pages and then we each have a round up on a Sunday. Let’s all share that being frugal can be fabulous. Please take a look at my fab co hosts and their posts, Cass at Diary of a Frugal Family, A Thrifty Mum and Emma at Mum’s Savvy Savings. Now with all that cooking we certainly go through soap washing our hands and love this soap dispenser from Mom on the move. This list will close in 1 day, 4 hrs, 44 min (5/2/2015 11:50 PM Europe – Greenwich Mean Time)What is a blog hop?